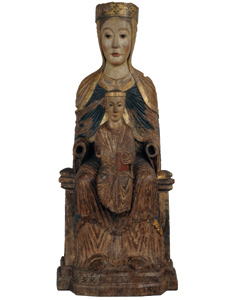 This splendid carving of the Virgin and Child, from Puentedura in Burgos, is one of the highest quality Romanesque figures of the Virgin Mary in the museum's collection. Here, Mary is represented as the Sedes Sapientiae, which is to say, as the throne of wisdom used by the Christ child. Both figures are shown in a rigorously frontal and majestic position. Mother and son maintain a distant attitude toward one another. Notice the detailed treatment of the folds in each tunic and cloak, as well as the serene beauty found on the Virgin's face. The strong composition and a tendency toward naturalism exist in perfect balance. The carving's extraordinary quality and style can be compared to pieces from workshops in Ile-de-France from the second half of the 12th century. A new sensitivity and naturalist tendencies begin to emerge in these works, setting them apart from pieces that are more stereotypical and popular, having been produced by local workshops.